We are the Henry Sibley High School FIRST Robotics Competition (FRC) Team Lightning Turtles. 2018’s the year we’re coming out of our shell and expanding to 40+ students and we really need your help! We’re student coed team (open to all) of technically and non-technically focused students dedicated to building a team -- one that builds robots and real-world engineering, programming, fabricating, business, public relations, social media, graphic design and leadership skills for high school students. For 2018, our lead mentor from Ecolab -- Charles Nepomuceno -- joins us for a second year after 14 years with a Championship FRC team in Indiana. He’s also joined by Doug Sisk (HSHS Tech Ed Teacher) and seven mentors from Ecolab, Mayo Clinic, 3M, Leidos Software and Best Buy. We’re in the training season now, bringing on 24 new recruits (on top of our 18 veterans) and we're teaching them to design, build from scratch, program and test a large-scale robot to complete a complex set of competition tasks. The team will be building our for-real competition robot in Jan-Feb 2019 and taking it to two regional competitions in the spring. In Duluth, where we'll compete in early March, we placed 4th overall last year out of 62 teams. 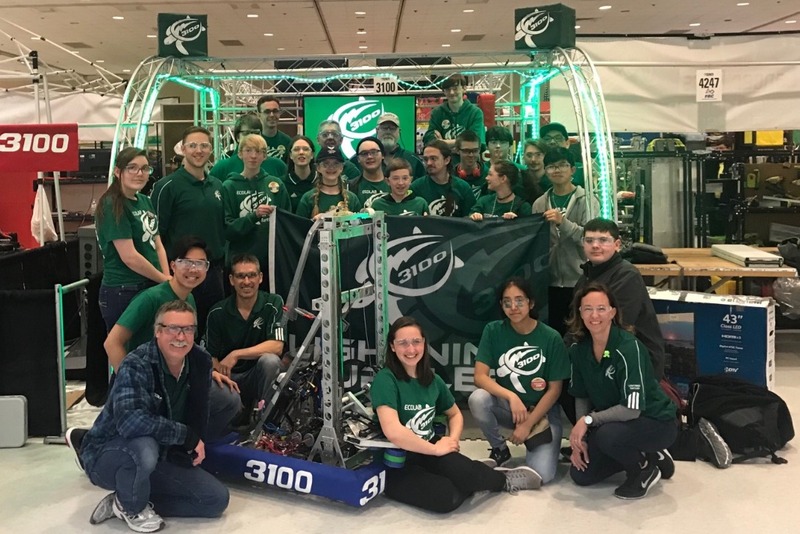 In LaCrosse last April, we competed and qualified for the Minnesota State Championships where we rose to the top 10% of all Minnesota teams and won the coveted Design & Engineering Award. This spring, in addition to Duluth, we'll be competing in Minneapolis in late March. Building robots and entering competitions is very expensive. We need to raise $34,750 to cover the costs of competition fees ($9,000), robot build and fabrication materials ($4,000), tools/pit materials/team apparel ($3,750) and team transportation and lodging for out-of-town competitions ($7,000). If we are selected to attend the World Championships, we'll need to raise additional funds for entry fees, transportation and lodging to attend the World Championships in Detroit Apr 24-27, 2019 ($11,000). We need donations and sponsors to keep our team running. Every donation helps, and your name/company will be part of our website Thank You page. 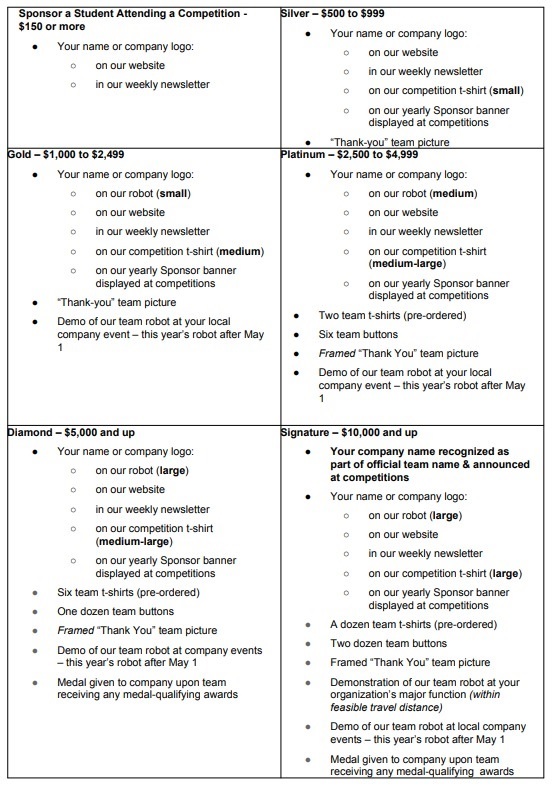 For higher sponsorship levels, you can be featured on our team t-shirts, right on our robot or even part of our team name. Henry Sibley Robotics is a 501(c)(3) non-profit tax-exempt organization. We appreciate both cash and in-kind donations. A letter of confirmation on tax-exempt status and a W-9 can be provided on request. Our tax ID is 83-0904663. Checks can be made payable to “Henry Sibley Robotics”. Electronic account transfer info can be provided. All donations are tax deductible.